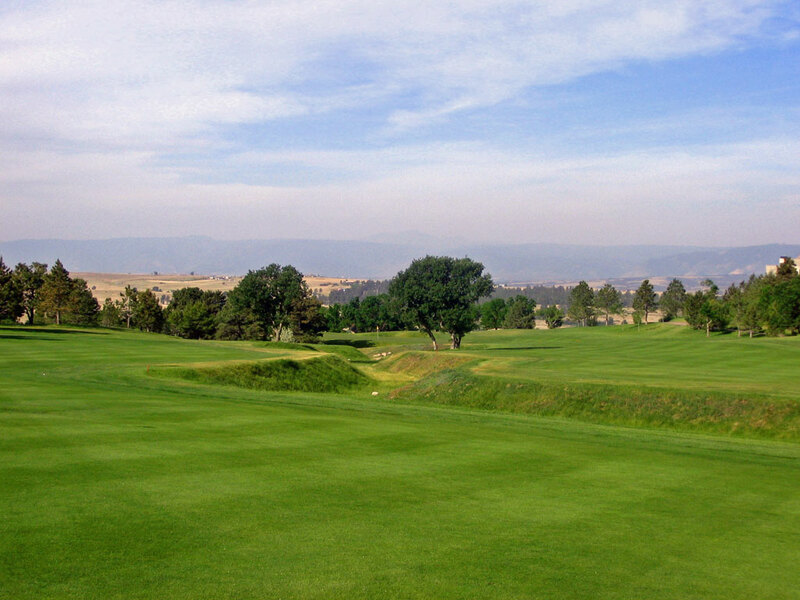 Accolades: Ranked 2nd in Colorado on Golf Course Gurus' Best in State list. 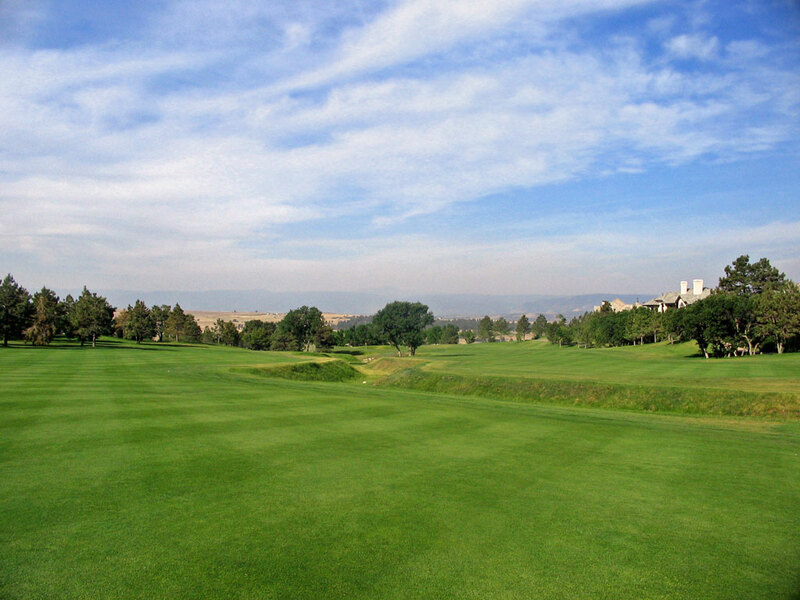 What to Expect: It is always a treat to play a PGA Tour venue which is exactly what Castle Pines was from 1986-2006. 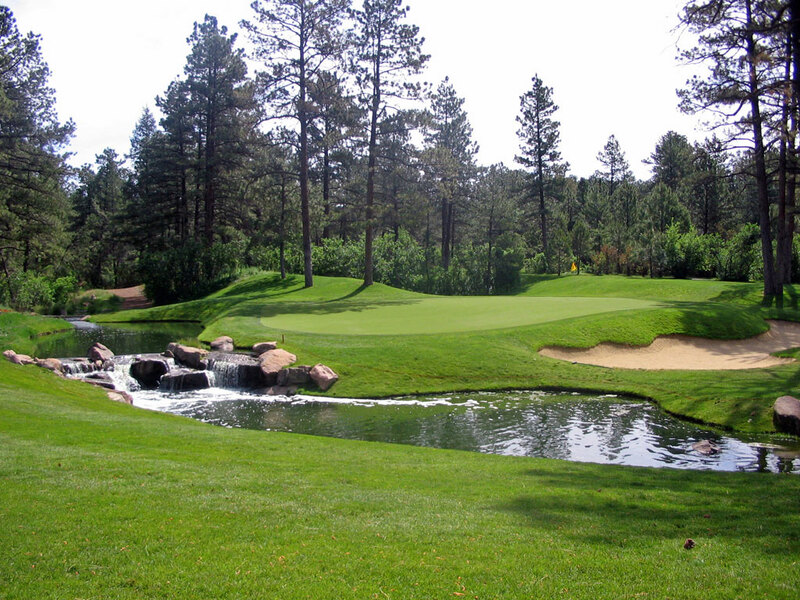 For 21 years the Castle Pines Golf Club played host to the world's best at The International golf tournament that made famous the modified stableford scoring system. There are more national members than local members at this prestigious club that has a strict dress code in force that requires males to remain clean shaven and remove their hats when anywhere in the clubhouse. The course is full of elevation changes with each nine starting high on the property before working down to the bottom and back to the top to finish out. You'll also become good friends with your 5 iron due to the length of many of the approach shots you'll be faced with. Finally, you can expect perfect conditions, fast greens, and gorgeous views along your journey of Colorado's finest track. Signature Hole: 11th Hole – 197 Yard Par 3 – While the 17th is often referred to as the signature hole due to the drama that would unfold there at The International each year on tour, the striking downhill par 3 11th is the real beauty. Playing from a very elevated tee to a green fronted by a creek and protected by bunkers on the right, not hitting the green can often result in your ball plugging. Generally requiring nothing more than a 7th iron, this is an exhilarating tee shot. Best Par 3: 11th Hole – 197 Yards – Featured above as the signature hole, the 11th hole at Castle Pines drops 75 feet from tee to green. With a drop of that measure, the wind becomes a very difficult factor to adjust for as a tee shot that is only off by a couple of degrees can be magnified into a severe miss. The attractive green site features a boulder filled creek and mini-waterfall crossing in front of the green with colorful flowers beautifying the scene. Commit to a club and swing with confidence because you'll need to execute a near perfect shot to score well here. Best Par 4: 3rd Hole – 462 Yards – More often than not, par 3s and 5s represent the highlights of a course due to the additional drama that tends to be created with them. However, the four pars are the stars at Castle Pines that easily has the best collection of two-shotters of any course I've played. There honestly isn't a weak par four on the course (I particularly like numbers 5, 6, 9, and 12), but the risk/reward nature of the 3rd hole makes it king. A stern test of golf at 462 yards, a barranca splits the fairway down the middle requiring the player to decide which fairway they want to play to. A tee shot up the right side to the smaller fairway requires 261 yards of carry to reach the short grass but affords an easier, much less troublsome approach shot. The wide fairway up the left side is much easier to hit, however the angle left on the approach shot forces a carry over the meandering barranca that leads up to a deep bunker fronting the shallow green. The choice is yours, but under either scenario par is hardly a gimmie. 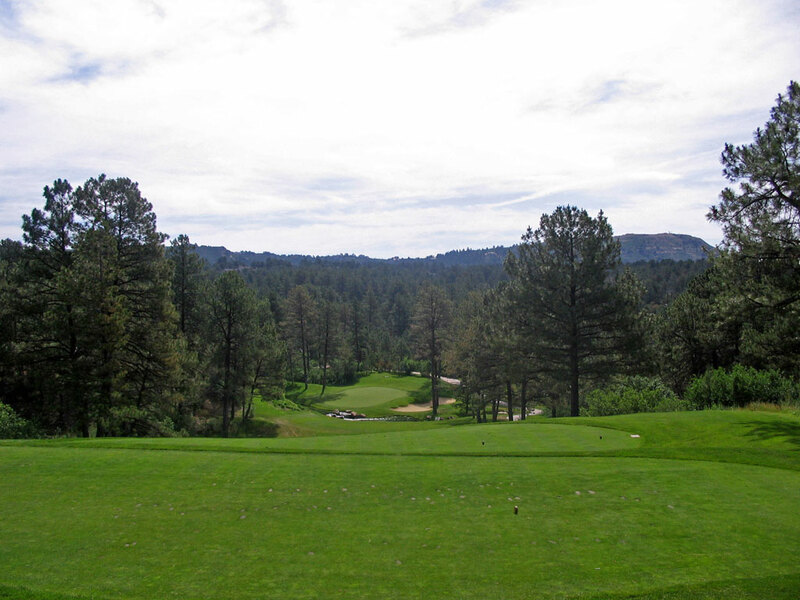 Best Par 5: 1st Hole – 644 Yards – The opening tee shot at Castle Pines sets the tone for the entire round. 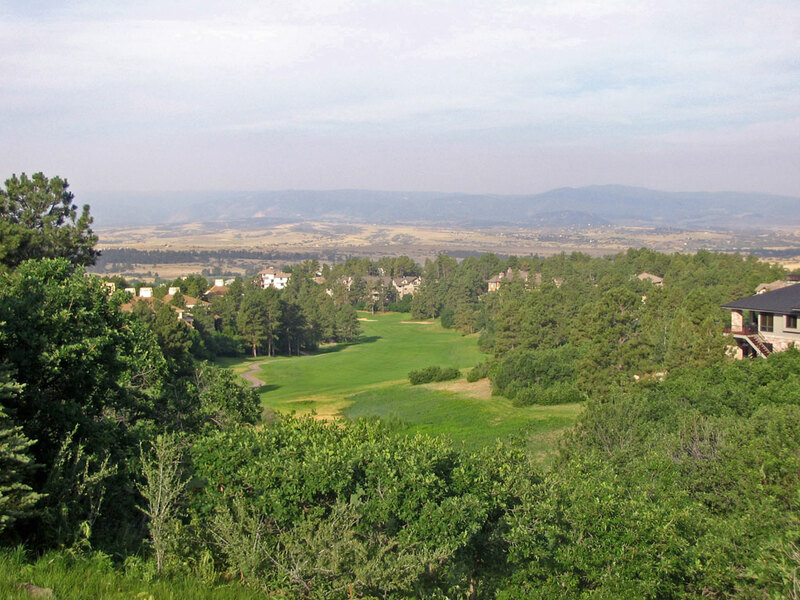 As you stand on the tee you are granted panoramic views of the surrounding Castle Rock area before bombing your tee shot on this 644 yard par 5 to the fairway resting 150 feet below. It is an inspiring way to start the round and one that you won't soon forget. After you place your tee shot the only thing you have to be cautious of are the bunkers that start 50 yards away and then run up alongside the green. Birdie Time: 17th Hole – 533 Yard Par 5 – Anyone who has made an effort to watch The International PGA Tour golf tournament knows that the best scores year in and year out are posted on the 17th hole. Just 492 yards from the tips, this uphill par five is very reachable in two with a well placed drive up the right center of the fairway. Steering clear of the bunkers fronting the green and staying below the hole are critical in your effort to score birdie, but nothing will dash your scoring hopes quicker than having your ball end up in Cally's Creek which runs up the entire left side of this dogleg left hole. 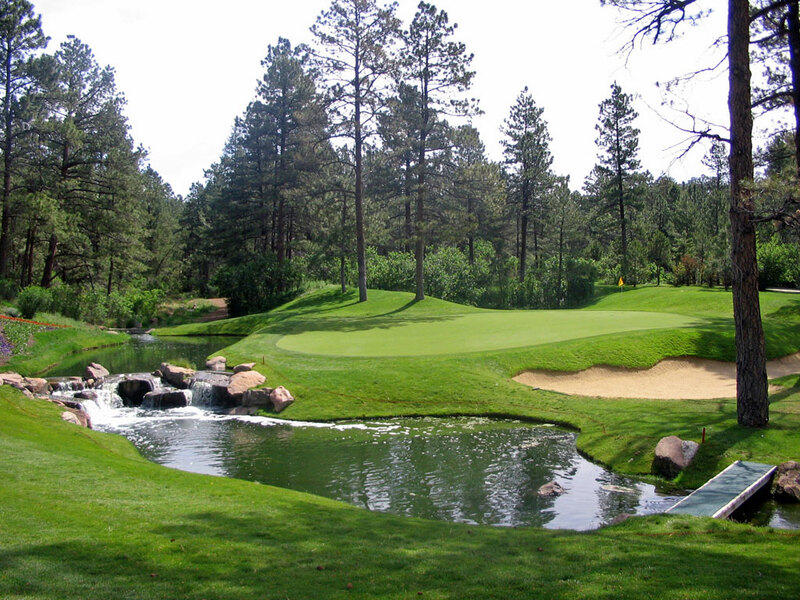 Only a few yards longer than Castle Pines' tough par four 10th, the 17th gives you a great chance to go under par. Bogey Beware: 10th Hole – 485 Yard Par 4 – When a course has a 77.4 course rating and 155 slope, you have plenty of options to pick from when deciding which hole will likely deliver the golfer a bogey (or worse). 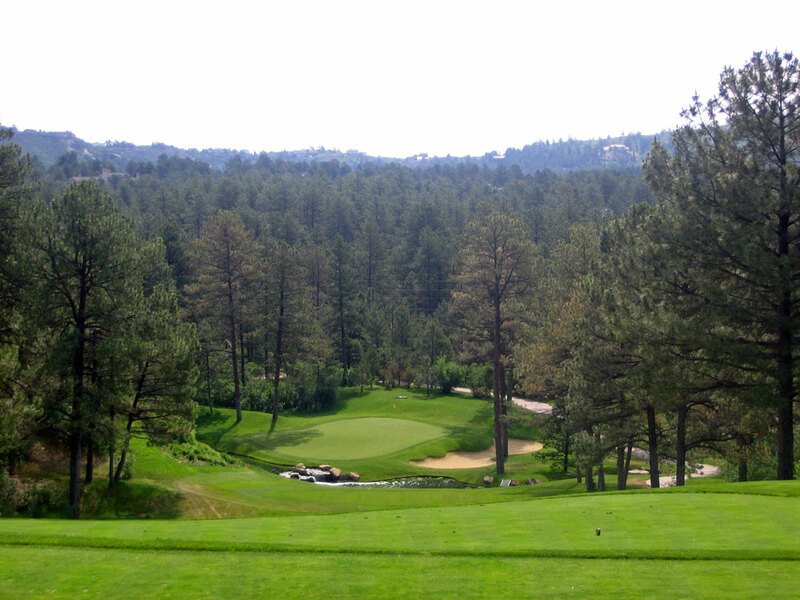 When the dust has settled though I gotta go with the 485 yard par four 10th as the toughest hole at Castle Pines. Playing downhill the entire way to the slanted green, the most difficult aspect of this hole is the long approach shot over a lake fronting the green. After your drive you will inevitably be left with a downhill lie which makes skulling your shot into the lake all too high of a possibility. Regarded as one of the most difficult holes while on the PGA Tour, the key is to play this hole up the left side and then hit a cut shot over the strip of land leading into the green and thus effectively taking the water out of play.